Being frugal and saving makes for an abundant life. Ok, so this is a sad beginning to stocking a pantry. I don’t have the wide shelves filled with hand canned veggies and fruits from my garden…yet. But I’m on my way! I have been up early this morning due to someone’s damn dog barking from 4:00 am onward at unseen forces out to get the neighborhood. While I thank this dog and the others that joined in to help protect us all…I’m wishing that the owners would bring them in the house and we could all have some quiet. All I want to hear at 4:00 am is the moon. So, I made use of this early hour and read some blogs from fellow housewives. https://aworkingpantry.blogspot.com/ is a good new blog for me. She and her husband bought a burnt out house on some land for $3,000 and I was enjoying their journey. She talks about stocking her pantry all year and by hand. Meaning, she cans and dehydrates and all that good stuff. She also wrote an article to wives on stretching that buck. It got me thinking. Many of us wives are in different situations. Some of us live in apartments with a balcony and some in a house with an acre. Obviously, with the land, you have fruit trees, gardens, maybe a large pantry or basement, and you can store and can up a storm. What does the apartment wife do? Then there are issues of living rural and living urban and what each issue brings, along with what state you live in and what the cost are. For example, we live in California so housing is insane. If we lived in Kansas maybe the housing is half the cost or less. Just guessing here. How about the women that don’t have all these fancy skills? I am one of these ladies. I can crochet one stitch and really have no ambition to learn sweater making. I have yet to can but I have pickle cucumbers growing now and have set a goal. I have no pantry just this humble shelving unit in my office/laundry room closet. My fruit trees are infants. My gardens are an experiment in agriculture at this point. Here is advice for those of you that are just starting out or have few skills in pioneering, for those of you living in small spaces or on tiny incomes. Here is a small collection of advice on how to stock a pantry…or make a pantry, save money, cut cost, and homestead where ever you are. Pantries can be made. Use a closet or if you have an extra room get shelving units. You can purchase at garage sales, thrift stores or free on craigslist or swap sites. See if friends and family are giving away shelving. You can use crates, boxes stacked on their sides or cinder blocks and boards. If a room or closet is not an option, reorganized your kitchen so that you have upper shelves free to stock up. Or clear out the closet of extra stuff and make that room. There are two ways to can; water bath or pressure canning. I’m going to start with water bath because I have the pot to do it and it doesn’t scare me. Guns and pressure cooking scare me. Not much of a prairie wife, I know. Youtube is great for how-to’s. Watch videos on anything you want to learn, including canning. Buy produce when in season and in bulk. Bulk is far cheaper at the Farmers Market. A trick I learned from a farmer there. Can during the summer with all that good and fresh produce. If this is not an option or of interest then be a sales huntress and when you shop you stock up on all the super savings (but only things you will actually use, eat). Slowly begin to stock up on the dried and canned goods. You can have a surplus of soups, baking goods, and I buy the 25 lbs of pinto and black beans, brown rice, white and wheat flour. Learn to make all the foods you eat from scratch. It saves money and it brings the heart back into the kitchen. Now, there are some foods that are just cheaper boxed or canned. Price things out. Maybe start cooking differently to save money and do scratch cooking. For example; mac and cheese or rice a roni is sometimes much cheaper than making it unless you cook in bulk and freeze some. Homemade yogurt will save some major dollars. Baking your own bread will save a lot of dollars as well. But most importantly, home cooking is cleaner and healthier. It’s also a skill and art. Use less meat or give it up altogether. Meat is pricey and especially if you want really clean, quality meat and eggs and dairy. Limiting all these items will help the wallet. In the old days the week’s menu had very little meat and then Sunday was the big meat day. When we ate meat I would just buy whole chickens that were antibiotic and hormone free. I would bake one up like they do at the stores. I would then take it off the bone and portion it for the week. Part was for enchiladas, part for soup, part for a casserole, and part for a cold salad. That one chicken would feed a family of four for a week. Have a grocery envelope. Allocate so much for groceries and stick to it. Make a game out of it and see if you can have any left over at the end of the month and roll it over for the next month or use for stocking the pantry. It helps to make a menu and be armed with a grocery list when shopping. Practice the art of no spending. Shopping can become a bad habit or addiction to fill in boredom or being unsatisfied. Find ways to fill your time with activities that are free such as reading books from the library or free ebooks from Prime Amazon. Take up walking or jogging in the morning or evenings. Watch a movie on TV. Don’t shop. Make do with what you have. This is a worn out phrase but worth repeating. When I can’t spend or shop it is amazing how creative I can get and what I can find around the house. Examples would be using a bath matt in the kitchen instead of running out and buying a cute kitchen rug. Needing shelves and using crates, paint them or put a nice clothe over them and a big plant. Find ways to make money and have a creative outlet from home. Blogging, writing, some ladies seem to like these Swagbucks. If you have no children and you do have time on your hands take up a house cleaning job, walk a dog for cash. Growing your own food is free produce. A few bucks for seeds or $25 for a fruit tree and you have food for years to come. You can use food stamps to buy seeds and fruit and nut trees. If space is limited learn container gardening and some fruit trees are dwarf and can grow in a large container. Downsizing. I’m big on this. Only have as much house as you need. Only have a car if you need it. Get rid of clutter and extra stuff. Downsize to what you truly need and love. Sell the rest or bless others with your goods. Don’t turn down hand me downs. I take everything offered. That way people always know to ask you first because you are so accepting. It also tells the Universe that you are open to receiving and God loves a humble and welcoming heart and hand. I have all sorts of kitchen baking equipment, a big, old TV, a queen sized bed with frame, old round table, chairs with lovely red and gold seats, Paintings, plants, toys, and years of boys clothes…all given to me. Oh, and one neighbor brought us a ready to cook homemade lasagna and another neighbor brought us cupcakes the other night. NEVER turn anything down. If you don’t want it, gift it or donate. Wear clothes that last. I prefer cute t-shirts and jeans. They last forever and no special care. With all the gardening and children I must have sturdy clothes. Add earrings, lip gloss and mascara, perhaps perfume and you will always look nice. Have a low maintenance hairdo. Long hair is the best. You just put it up. Trim the ends yourself. You can get inexpensive dyes at the store. Once you get into the short hair (as I have recently) you need regular appointments. Cost can get up there. Get rid of the TV or have that smart TV where you can stream Netflix and Amazon for free. Cable and Dish are ridiculous. You pay for infomercials. Antennae are great but don’t work everywhere so check that out too. Get chickens. Chickens are legal in some cities. Make sure and check with the city. There are limits and roosters are usually out. Chickens eat bugs, their poop is great for your garden and they give you the gift of breakfast. Eventually, they can give you the gift of chicken and dumplings. I, personally, could not eat my girls…sort of creepy really if you think about it. Don’t have pets unless you can afford them and are completely settled. People get pets and then have to move and get rid of them. Think hard about this because those dogs and cats grow happy and feel safe with you, they form a bond. When you have to take them to the shelter it is heartbreaking and traumatizing for them. People need to not be so light about this pet thing, it’s as serious as adopting a child. Music is free and fills the home with fun while cleaning or living. Pandora or other free stations online or the good old fashioned radio. No need to buy music. Water everything down. I water down my dish soap, shampoo, baby bath, hand soap, even my cement paint yesterday (a bit too much). It doesn’t take away the quality or effectiveness. It actually improves these items because all of it is so condensed. Drink only water. We don’t do soda, juice, or milk. They aren’t good for your health or wallet. We love ice water and that’s all we drink. Make coffee and baking your new drink and drug of choice. We don’t do drugs, drink, or smoke pot in this house. I used to and boy did it cost money. Coffee and a sweet is my drug and drink of choice now and I save so much money, not to mention brain cells and joy. 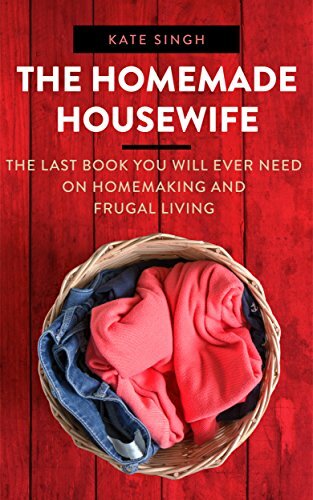 Get some frugal books or read blogs by other money saving wives to inspire you. The Complete Tightwad Gazette by Amy Dacyczyn or my The Homemade Housewife will give you a thousand ideas on saving. Hang your clothes outside or on inside racks. To save on the energy bill in the summer look into the window AC units. That’s a huge savings. Stay home. Make your home clean, tidy, cozy and filled with books and all the things that make you happy. We have yarn and sewing, baking goods, a TV, books. I have my garden out back, chickens, and the boys have blocks and puzzles and a big sand box and climber in the backyard. We love being home and it saves money. Walk everywhere. It saves gas, wear and tear on the car, it’s green and healthy. We love walking the neighborhoods. Turn it into a game, read, research, learn, play. It will benefit you and your family in the end. Having no debt is peace and freedom on the grandest level. Previous Becoming vegan. How to love every bite. Next Return of the old fashioned housewife. Great advice, as usual. Your pickles will be delicious. One thing that I do add is Pickle Crisp (calcium chloride, I do believe), made by Ball. Many people I have talked to complain about soggy pickles and Pickle Crisp really works great to keep them crunchy. Water bath tomatoes and salsa are also really easy! I don’t think anyone out there knows all the cool pioneer woman skills to have, but I think, more importantly, is to stay a lifetime student. Never stop learning and researching. I can tell that you do, and so do I. I will usually so something until I feel I am pretty good/okay at doing it and then try something else new. I so love to learn. A “Jill-of-all-trades” if you will! Keeps my brain healthy. Ha ha. We just got back from vacation and we stayed in a tiny house of 399 square feet. Even with 4 people, it never felt cramped. It is one square foot less than my sunroom. It took less than two minutes to sweep the entire thing…ahhhhh. I was already in a decluttering mood when we left, and now it really has my mind spinning. It was so nice to have the freedom of uncluttered space! Now it’s back to reality and I think this was a perfect way to get me back on the decluttering track. Hope all is well; sounds like it! I always enjoy your posts. Thank you for the pickle advice, I was just talking to grannie about this and I never would have thought about soggy pickles but I sure would have been disappointed. I have two cucumbers so far and not sure what the heck to do with them…can two…wait for their siblings? Probably best to make those into fridge pickles and wait for the inundation of cukes later! That’s what I used to do. I don’t care for pressure canners/cookers or guns either. But in my state, I’m guessing 90% of homes have at least 1 gun, maybe a dozen. I think it’s crazy but I’m not going to change it . You are right that we all have different circumstances. We can’t really copy each other but we can certainly learn from each other here in Blog world. I think your doing great with all your works and goals. You can sterilize your jars in the oven, I let them there for an hour at 100-120 degrees Celsius and then let them cool gradually. The same efficiency as at “bain marie” (boiled in water). But there is a lot more space in the oven. The jars are hot when I put them in the oven. Yay!!!! This is so wonderful. All is looking up for you two. Now, get that cheap laptop so can really go for it in the blogging. Mine is in the pawn shop. I’m getting it out to! WONDERFUL!!!! So happy for you, Bee Humble! Thank you Evelyn! Love and prayers! Im in australia so things are a bit different but the consept is the same! I have heard that Australia is very expensive. So, yes, same ideas but working with a different money situation. Yea we are currently in the red budget wise, but hopefully some good budgeting and better money management will bring us back. We are with you in the red budget. It happens fast.